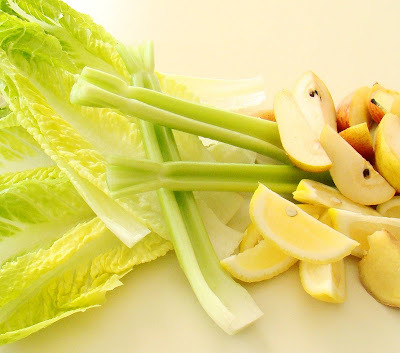 Before you cringe at the combination.....its actually quite good and the taste has become quite habit forming as the lettuce w. celery, lemon + ginger do dress well together. I always thought lettuce juice or wilted lettuce was gross, but this turned my head to a nod. Natalia Rose's recipe includes the use of 1-2 Fuji apples to sweeten up the lemonade and I have thrown in two baby seckel pears for good measure. scrubbed + trimmed by a fanatic - it's not as crazy + time consuming as it may appear.....but maybe it's me.....kinda like bathing babies, trimming toenails + brushing the hair back to make goo goo glossy new.....remember how pretty babies look after a nice bath? wwwhat?.....who's spending too much time with vegetables?! As you noticed, I have had to split down some of the vegetables and fruits to make their way through the portal with ease. Okay before you think I am schizoid about my food posts - yes I am quite extreme....but I do love my vegetables, fresh fruits and I enjoy decadent feasting as if I were dining reclined @ Roman banquet après watching the games @ the Parthenon.....I have always wanted to raise a toast with a silver chalice full of mulled wine. But really at the end of the day.....all that feasting & jousting makes it way back to me.......and I totally refuse to wear that girdle + snug tube thing they are selling now.......what's that thing called? Why?! ~ just because I adore sausages....esp. Louisiana Hot Links doesn't mean I have to dress like one. I am a baby(beginner) raw foodist ~ and am trying to balance + make happy my love for healthy & passionate decadent foods like the stuff I recently came across at FXcuisine.com ~ truly lovely gorgeous crazy bejewelled dining. I admit, I am an extremist about things. But funny thing.....it has been working. I am pretty raw 3/4 of the day (unless for lunch meetings where I try not to let all heck break lose) and at the end of the day eat a beautifully cooked dinner with lots of fresh vegetables. 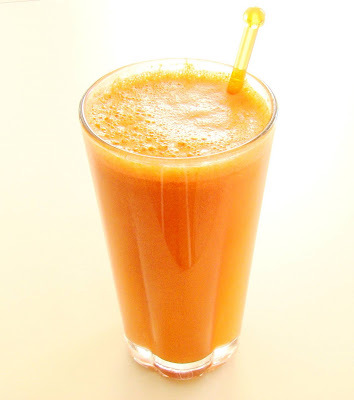 The juicing has just become part of my ritual ~ when I am busy and away. 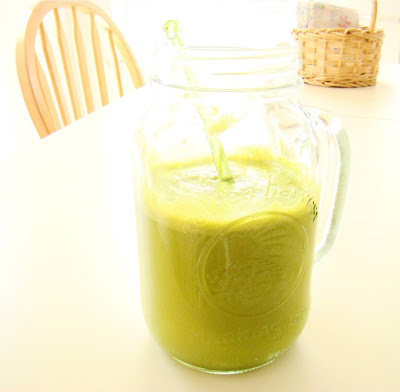 I juice everything in the morning & take with or keep storage in the fridge for later in the day as needed. 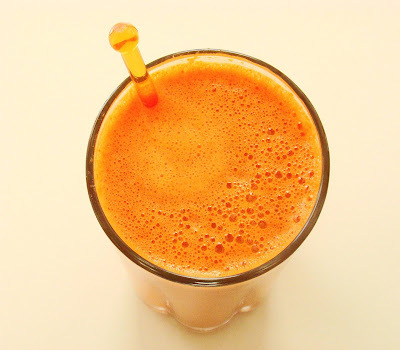 As if I didn't have anything else to do ~ but for those of you that do juice & include the raw diet in your daily gear....boy, it does make a big difference in how you feel! Trying to live healthy & happy.....essentially want my cake, lobster, sushi rolls + slim trim waistline at the end of the day.....we'll see. 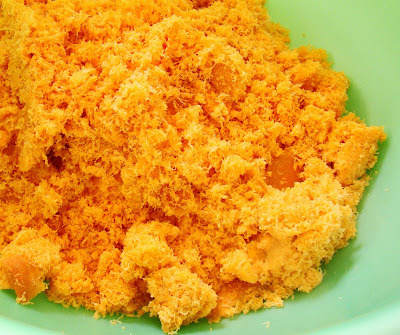 Okay ~ what to do with pulp? 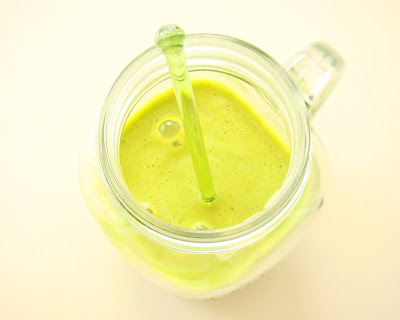 "I blend up all my vegetable leftovers in my blender with water until I come up with a slurry that I then go out and pour directly into the soil in my garden. Oh, I put in the egg shells too, blend 'em up. Banana peels. Tea bags and coffee grinds and also the coffee filters -- add water and blend away. The reason is, there is no soil here in Florida -- it's all sand. Nothing organic in there at all except what I'm feeding it with my leftovers. When you pour the slurry into the earth, it absorbs quickly, goes to work with the worms and bugs......Sometimes I water it in a little if it sits on top of the soil too much. 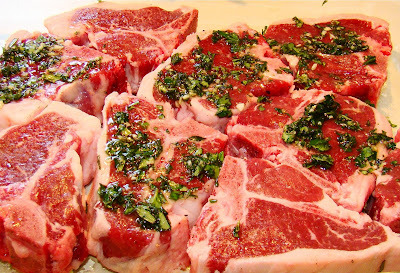 The key is to not ever ever put any meat or protein or fats (oil) in with it ... and to throw in a little garlic if you have a clove, to keep critters away. I do this several times a week. Always have a container on my counter for such stuff. Other parts of the country they do actual composting, but here in Florida, too many bugs, bees, wasps, etc. so this has been a great solution. I have the yummiest flower garden soil this side of the Georgia line. Just add water and pour it into your soil....maybe take a couple of good digs before and after to get it under the surface. Go check it in a week and see the fat earthworms chowing down. Okay ~ so juicing can go full circle. 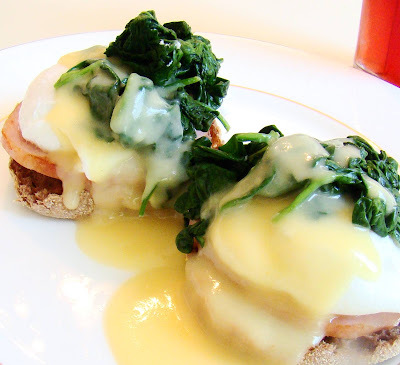 Easter Sunday is always a good excuse for eggs benedict. It is an avid ritual that I have picked up from my *luv's* family. There's a slight adjustment here and there with the addition of fresh spinach leaves slightly sauntered in boiling water with a dash of sea salt. I doused it with cool running water with a slight conditioning of red wine vinegar to whisk away the slight aftertaste of cooked spinach. Straight off the griddle, I have placed the delicate slices of Canadienne bacon on top of toasted whole wheat english muffins. I had fun poaching these in simmering water....let the water simmer but not dance to that threatening boil. Always at a high sustained simmer. Then crack an egg in a bowl. Lovingly slide in that swallow of an egg into the simmering water and watch it poach to creamy perfection. I am a bread freak. When I was growing up in San Francisco, my family ran a deli in the Mission District. I remember the mornings when the baker would arrive with freshly baked french bread snugged tightly in brown paper bags. With that said.....wheat bread.....and WHOLE wheat bread has always been a slight issue for me. Until I relented to think outside of things and try things outside of that safe house of my thinking. Yes, I know it's just wheat.....in all it's plain glory. Long story short ~ I like wheat bread now. I actually love WHOLE wheat bread and whole wheat anything now. 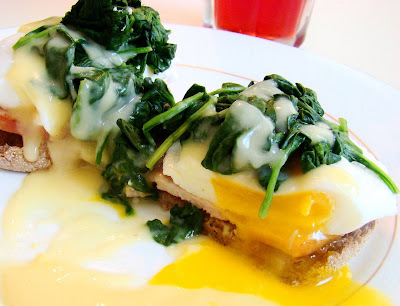 'now....I am back to eating good & green ~ so let's be good.....well at least for awhile. This salad + veggie roll has been one of my favorites lately. I hesitate in saying the word 'wrap' since the ones I have tried at the restaurants try to imply they are healthy but often times I find over burdened with excessively cloying greasy substances. Now don't get me wrong....I love oil in my cooking....can't do without ~ but I love really good olive oil.....sesame oil.....grape seed oil and even sunflower oil. I just don't like recycled regurgitated hydrogenated oils that seem to burden our foods. 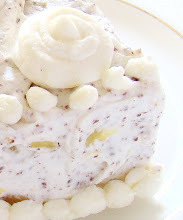 *optional: veganaise grapeseed oil dressing ~ omg; i luv this stuff....tastes + has the scent of mayonnaise! this is eggless and very heart & body healthy. 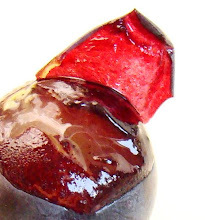 Roll forward tightly......you can cut in half with a sharp knife and wrap it in plastic wrap to take with you or enjoy now! For lunch on the run ~ I end up eating two of these to fill me up. Delicious with a simple dipping sauce made with a shot of soy sauce + shot of sriracha or hot sauce of your liking. someone told me that alfalfa sprouts combined with avocado creates a taste sensation that is a match made in heaven......I do agree. 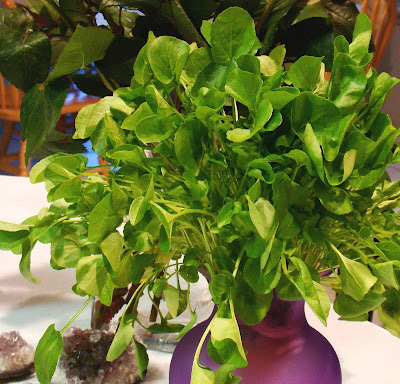 I made this gorgeous salad last Friday night with the organic watercress (the one shown above) that followed me home from Native Sun. This was literally a last minute supper thrown together in haste. It's also a meatless day for me (Lenten Fridays!) so I grilled a wild rice tempeh patty with water, wine & soy sauce, then topped it with organic rennet free cheddar cheese on Ezekiel bread - turned out to be a savory & filling Friday night dinner. When was the last time I had fish sticks and tator tots for Fridays during Lent??? 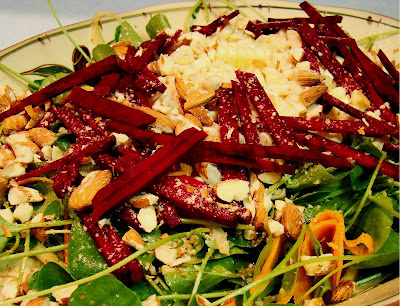 The salad I made included the following organic ingredients which amped up the taste value considerably - organic watercress+beets+carrots and organic raw almonds. I also prefer to use old fashion carrots in their natural born SHAPE - not the pre-formed baby carrots which are completely tasteless! 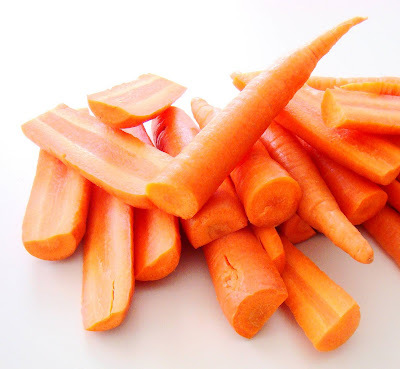 Try going back to eating and cooking with big meaty carrots and you'll taste the difference in quality. You'll return to the sweet, crunchy and earthy taste of a true root vegetable rather than biting into pre-meditated water-filled Styrofoam. Unfortunately, I don't live in an area where farm fresh organic produce is overtly available in mass diverse selections....ie: think massive access @ New York's GREENMARKET. Luckily what I do have access to is one of my favorite locales @ Native Sun, as mentioned earlier as well as my local grocery store Publix which is beginning to carry a significant selection of organic goods. So work with what you have and at least try it. It makes such a significant difference in taste and ultimately in your health ~ as well as those that sit down and 'supp with you! 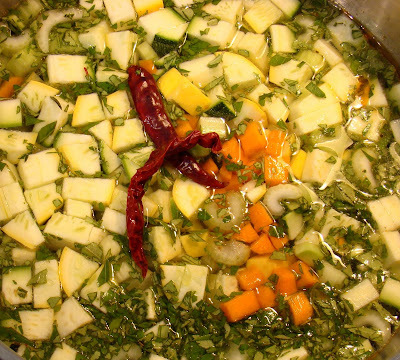 In a small bowl, whisk all the ingredients together for the dressing. 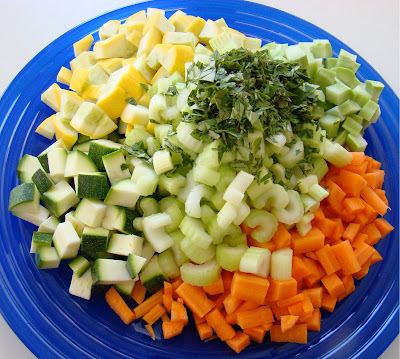 In a medium bowl, combine the carrots, onions and 1/4 portion of the prepared dressing. 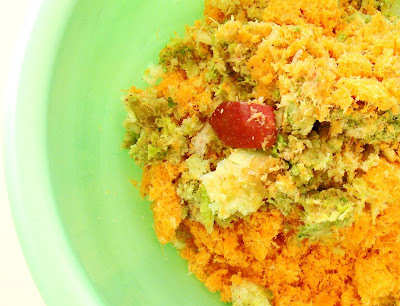 Combine dressing with shaved carrot mixture and set aside in refrigerator. Prep salad ingredients as noted above. *Trim corn off the cobb: Place medium size bowl on a flat surface. Place flat corn cobb end inside the bowl with one end of the cobb on the bottom of the bowl. Hold the top end with one hand to keep upright. Use a small sharp knife to trim the kernels off the cob beginning from the top of the cobb and running the knife through to the bottom. Trimming the cobb inside the bowl will keep the kernels from shooting all over your kitchen counter and floor. 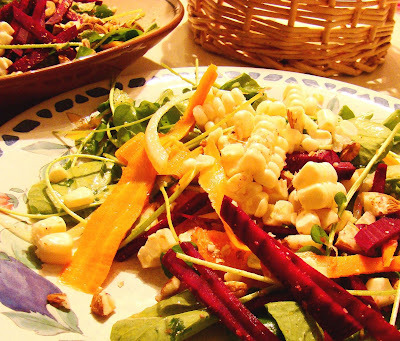 In a large salad platter, gently toss remaining dressing with watercress. Gently combine the marinated carrots to the watercress. 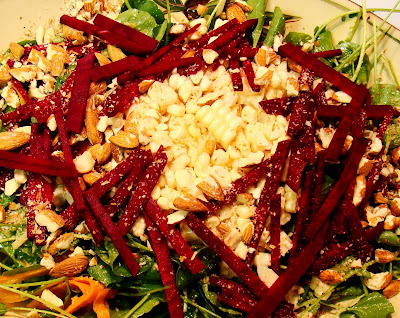 Top with corn kernels, beets and almonds. Also ~ Thank you for visiting me and all your awesome comments. I am really glad to have met all of you this past week through cybersphere - again thank you for stopping by! 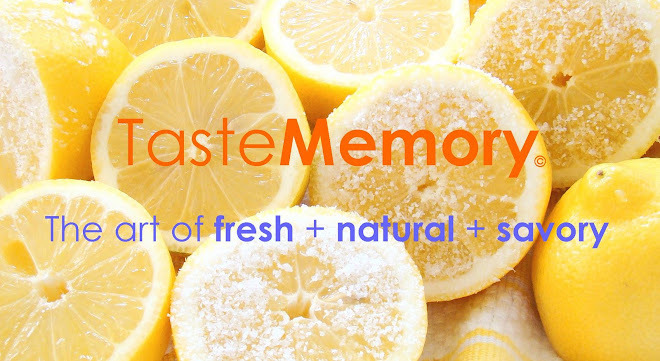 It's been great visiting your blogs too and reading about what is happening on your side of the globe.....and thank you to Blogger for highlighting Taste Memory as one of your blogs of note ;-) !!! Also on the pending posting list for Korean Cooking fans.....Yuk Gae Jang: Spicy Korean Beef Soup.....that's up next since I can currently tell it's been a visual obsession of mine for the past week. First off - I want to thank you guys for voting on the recent poll - and you got it! 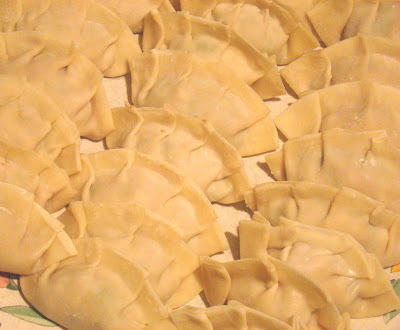 The winner is Homemade Mandu aka Korean dumplings kinda like gyoza I'd say. As you probably know by now, I am a freak about chopping vegetables. I love to chop, mince, shred and pulverize vegetables. 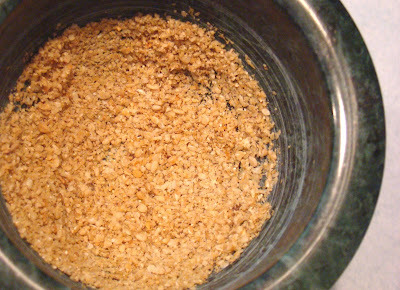 I especally love to mince garlic ~ my favorite thing to do lately. Many of you don't like this manic behavior.....so by all means use your food processor and/or other kitchen accessories to get this recipe off the ground. I am just pure lazy about washing dishes. When I was waitressing way back when.....had to force myself to help in dishwashing duties when it was my turn. It was even one of those mega industrial dishwashers and that still didn't have me convinced. Also - may I suggest to do this in steps, so you don't drive yourself nuts trying to conquer the world and make mandu in a day. 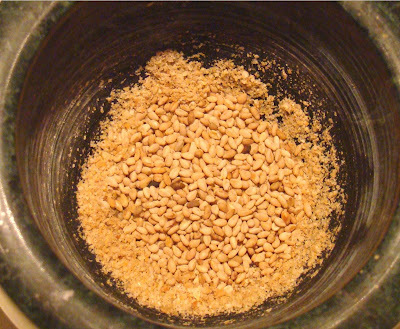 **use of toasted sesame seeds that are UNSALTED & GROUNDED is a very IMPORTANT aspect to this recipe. 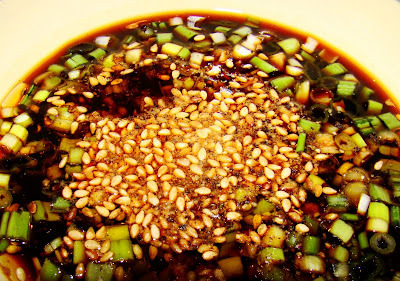 I have tested this recipe several upon several times and the ratio of the sesame seeds are perfect with the ratio of the sea salt mentioned fyi. In a large bowl, mash the tofu with potato masher or throw caution to the wind and use your hands.....it will just take a brief moment to create a chunky blend that is slightly smooth. Add the rest of the ingredients. Combine everything using a large spatula until all ingredients are thoroughly combined together. Koreans like to use their hands for this part, but a rubber spatula suits just fine. 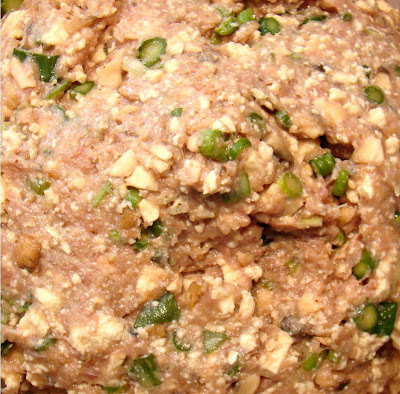 The mandu filling can be chilled overnight, but I suggest you prepare and cook it the very next day. 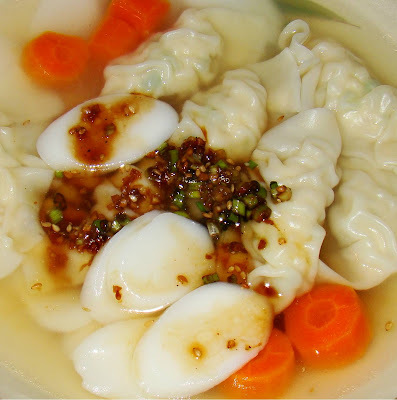 Arrange small bowl of cold water, mandu filling (you may want to bring half of it out at a time - keep the remaining half in the fridge), gyoza skins and a kitchen towel to wipe finger tips as needed and a lightly floured a dinner platter. 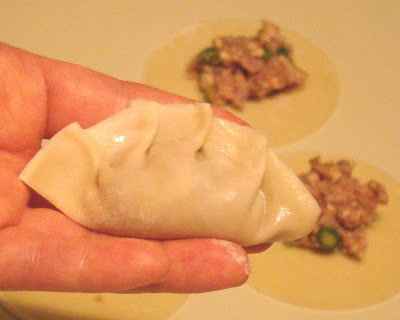 Place one gyoza wrap in the palm of your hand. 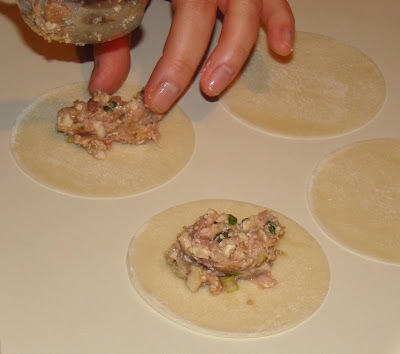 Put one slightly heaping teaspoon size portion of the filling in the center of the wrap. With your fingertip wet one half edge of the wrap with cold water. Fold and seal tightly. 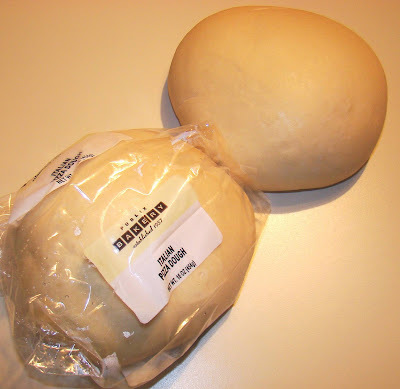 Make sure there are no air pockets between the filling and the seal of the wrapper. 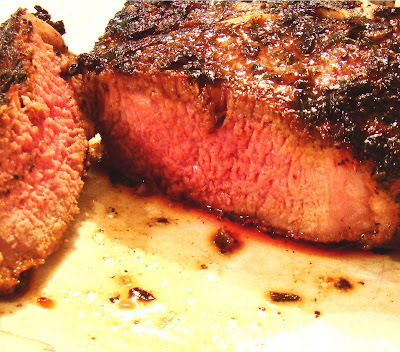 Make sure the meat filling doesn't creep out towards the edges. 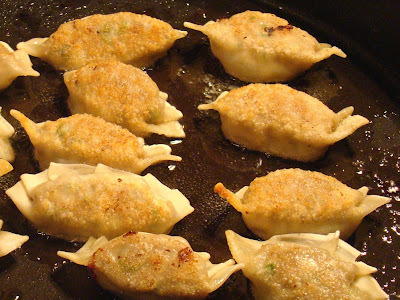 To crimp the edges: Lightly wet the outer edge and make about 4 to 5 overlapping folds one at a time and pinch down until secured....or can also pinch one corner of the wrap to the other to resemble a pillow (see fried mandu photo). Lay out finished mandu on lightly floured platter. Be careful not to have any of the wet portions touch each other. 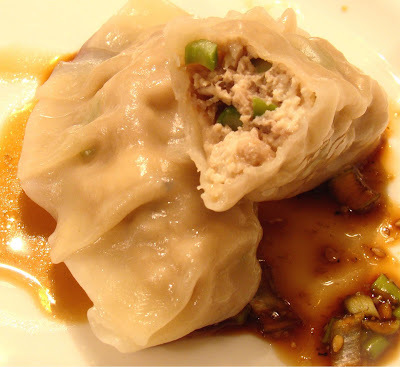 If you find the process of forming the mandu a little longer than anticipated; cover the completed mandu with plastic wrap and keep chilled in the refrigerator until ready to be cooked later in the day. 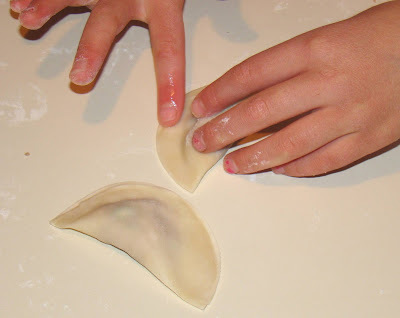 Start another lightly floured platter to place your completed mandu and repeat as needed. Don't worry that it may not come out perfect the first couple of times you do this. Its all in the heart & then the wrist....have fun and eat at the end of it all! In a quart size pot filled with water add 1 teasp. sea salt, 1 Tbsp. 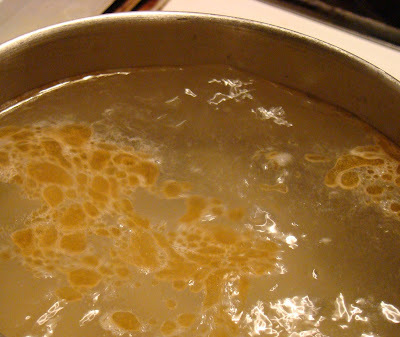 olive oil or sesame oil and bring to a boil. Gently drop in mandu, bring to medium simmer and cook completely for until the mandu rises from the bottom of the pot to the top. 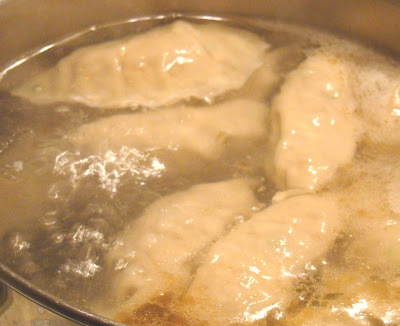 Allow the mandu to float to the top, thereafter cook for 2-3 minutes. Remove with a slotted spoon onto serving platter and serve immediately with seasoned dipping sauce. 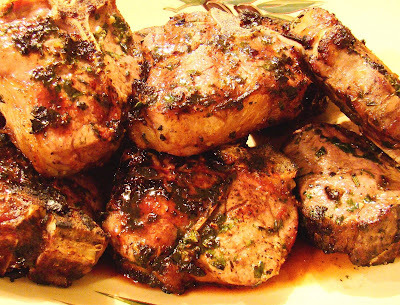 In a large saucepan or frying pan heat 2 tablespoons of olive oil or 2 tablespoons of sesame oil. Add mandu and be careful not to overcrowd. 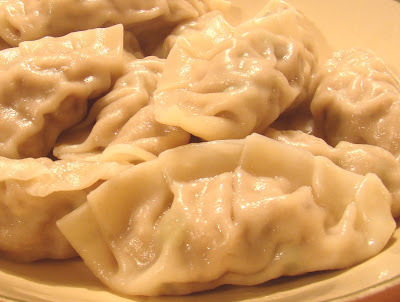 A large saucepan can accommodate about 20 to 25 pieces of mandu. 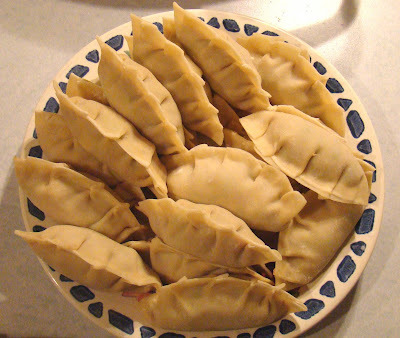 Gently brown mandu on both sides for about 10 to 12 minutes on medium to high heat until deep golden brown. Then, pour ¼ cup of cold water and cover pan immediately. Bring heat down to a medium to keep the pan simmering for 3 to 6 minutes. 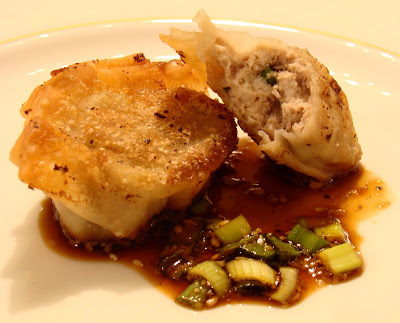 Allow the mandu to absorb the water during the cooking process. The mandu should be puffy like a pillow and check for the meat’s doneness but slicing into one before removing off the pan. 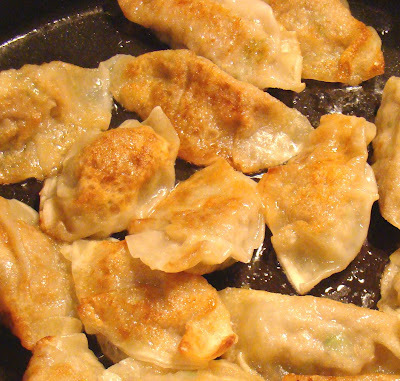 I have a thing about grease – so I drain the cooked potstickers on paper towels prior serving. Serve immediately with seasoned dipping sauce. 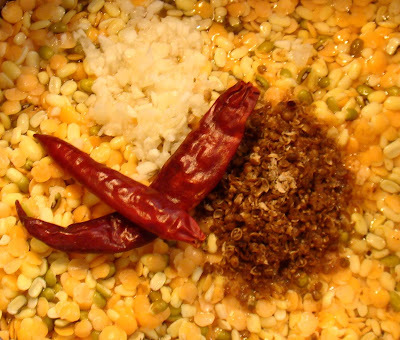 In a deep fryer or deep frying pan heat 3 to 4 cups of canola or sunflower oil to 350 F. Gently drop in mandu in small batches. Deep fry until light golden brown for 3 to 5 minutes. Remove and drain on paper towels in between batches. 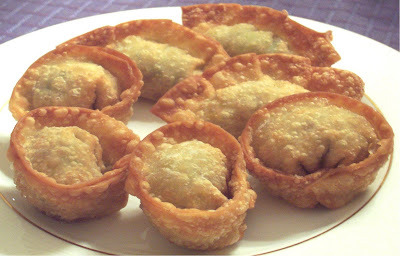 Then re-fry the batches mandu until a deep golden brown on all sides for another 3 to 5 minutes. 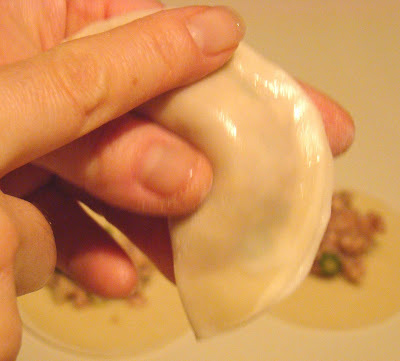 To check for doneness, cut open a mandu to make sure the meat is completely cooked. 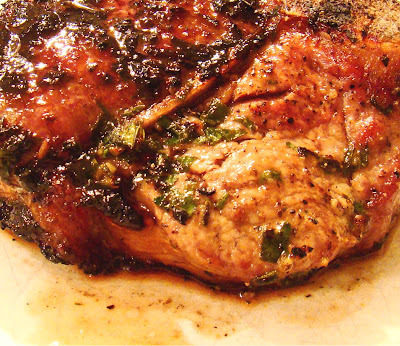 Serve warm or cooled with seasoned soy sauce on the side. hey, if a 6 year old can do it....plus she knows how to make the 'crimps' on the edges too! the crimp look - makes it tastier too...if you can't crimp (or don't have time), don't worry - go for the free flowing straight look. Okay is this the longest post ever? I have been spending more time writing about food: event planning about food, proposing about the preparation of food, how food works and who is making the food; rather than the ample time spent of preparing it myself. a deliciously healthy combined effort! Lay sheet of nori on paper towel. 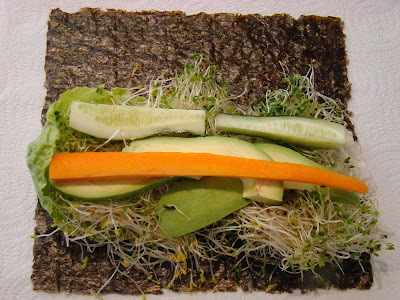 Put lettuce leaves down horizontally on nori sheet. 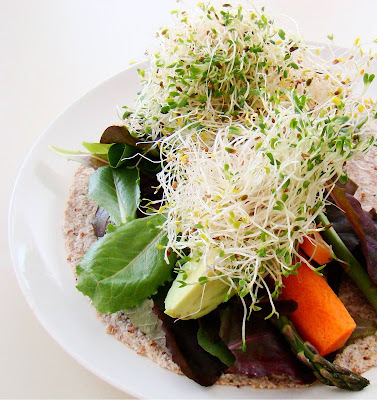 Top with generous handfulls of alfalfa sprouts. 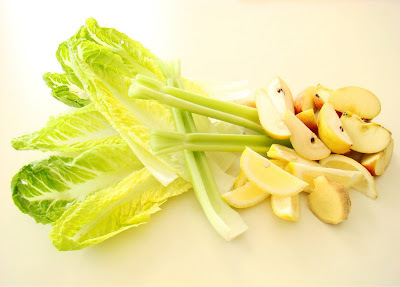 The lettuce and sprouts will be compressed during the rolling process, so feel free to use a generous hand of veggies. 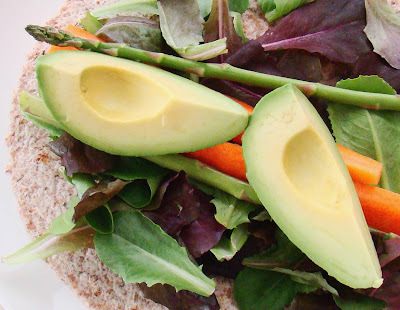 Place 3-4 slices of avocado on the bed of sprouts. Then place slices of cucumbers above the avocado. Top with carrots. 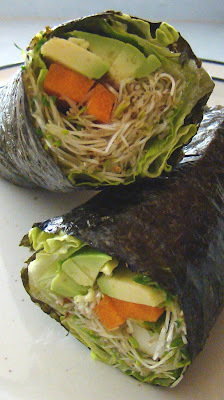 As the veggies are placed horizontally across the nori sheet, it will help in the rolling process that they are spread across vertically as well.....after the first roll ~ you'll see what I mean. At the end of the nori closer to you, gently start to roll forward using both hands. Gently yet tightly force the roll forward until you have reached the end, while making sure you keep the vegetables tucked in as you are rolling. 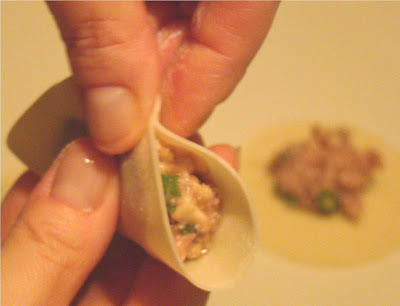 Keep the roll down with one hand, and dab the closing end of the nori with a thin spread of water to seal. Dry your finger tip on the paper towel. Seal and press down until firmly shut. Use a sharp knife and cut in half. 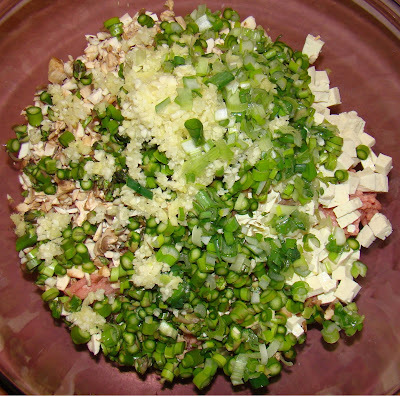 Enjoy with soy sauce, minced fresh ginger & wasabe. If I am in a hurry, I just mix a bit of sriracha with soy sauce for lunch on the go. I make four of these and have two at lunch with a raw salad made of shredded carrots and raw corn kernals. The last two rolls I save for my late afternoon snack before I pick up the kids. The other thing I relish the most is reading about food.....which I have had little time for as well. But....I have been going out of my way to nourish my thoughts literally. I recently came across a freakishly cool article in the New York Times about a Global Seed Vault opening up in the artic. A food vault? I didn't even know such a thing was in existence.....it has a doomsday sort of thunderdome or waterworld ~ end of tomorrow sort of appeal to it. *"All children need some sort of after-school care," said Pastor Criswell, who has become known in his neighborhood for taking on thugs and street-sold drugs. "We have to break the cycle of poverty and crime through education. But growing children need an after-school snack." *Moi~TasteMemory Girl gladly takes on the role of celebrity chef of the day with Triumph's awesome kids. Mucho Thanks Suzanne for inviting me to launch the baking campaign....! *How fun is it to make your own chocolate chip cookies? Rolling.....stretching......dusting.....mending.....lending and baking bread with these little ones was way too much fun. The best part of it was they had a blast! They also gave me pointers about not too much salt or too much sugar. Very good nutritional advice from these savvy kids! This was all part of the recently launched BE THE LOAF campaign in an effort to provide a safe haven and after-school care program for children in Jacksonville's troubled northside. The brain child behind this campaign is Suzanne Yack. btw: If you don't know her.....you definitely should. Suzanne has a tried and true history that will outshine the brilliance of any newly buffed diamond as far as heaven sent integrity goes. Out of pure dust (a bit of flour and words of wisdom too) she has voluntarily pioneered a campaign that is reflective of the loaves and fishes miracle. BE THE LOAF has arisen with hope for the children at Triumph the Church's after-school care program lead by Pastor Moses Criswell and Suzanne's Yack's insight. Last week, the program was not only amped with special coverage on First Coast News and the Florida Times Union, but the campaign received the honorary Points of Light Award from Florida Governor Charlie Crist. On February 27, Pastor Moses traveled to Tallahassee to the governor's mansion to receive the award from the governor. 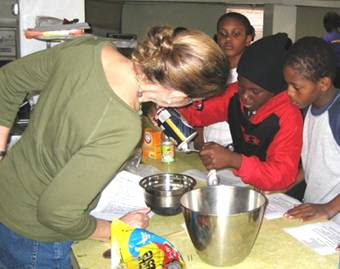 "Triumph the Church offers a safe sanctuary and tutoring for children on Jacksonville's low-income northeast side is asking for the community of good usable bread-making machines, peanut butter, jelly and juice." Well.......It's been quite and outpouring of bread machines. After they maxed out on bread machines; donations are slowly trickling in to feed these children healthy after school snacks, a little money to pay the gas bill and maintain stability for this program. 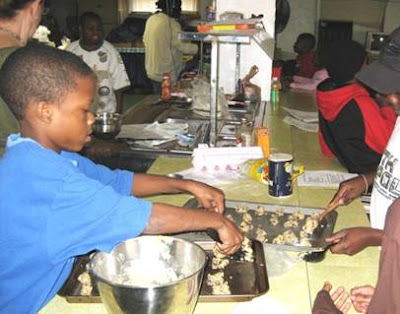 The 'celebrity chef' baking program has morphed from baking pretzels, cinnamon rolls, pizza and now chocolate chip cookies to showing the children how to make nutritious meals using 5 ingredients is scheduled as well. BE THE LOAF is still in it's infancy and asking for donations and community support to help build a strong and lasting foundation for these children. All contributions go directly to the BE THE LOAF campaign. Triumph Community Development Corporation is a 501c3 at Triumph the Church. All donations are tax deductible to the extent allowed by law.